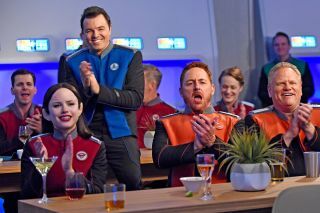 L-R: Halston Sage, Seth MacFarlane, Scott Grimes and Larry Joe Campbell appear in the Nov. 9 episode of "The Orville," called "Cupid's Dagger." Fox's "Star Trek"-influenced space adventure, "The Orville," will voyage on to a second season. Fox announced Nov. 1 that the series, eight episodes into its 13-episode debut, will return to the network next year, although Fox did not specify how long the second season would be. The series' creator and star, Seth MacFarlane, is known for the TV series "Family Guy." "Once again, Seth has struck a powerful chord with viewers," Michael Thorn, president of entertainment at Fox Broadcasting Company, said in a statement. "He has delivered a series full of optimism, drama and his trademark humor. We want to thank him and the rest of the talented cast, as well as the producers and crew, for an incredible first season. We can't wait to see where 'The Orville' travels in the second." "The Orville" airs Thursdays on Fox from 9-10 p.m. EDT and PDT.